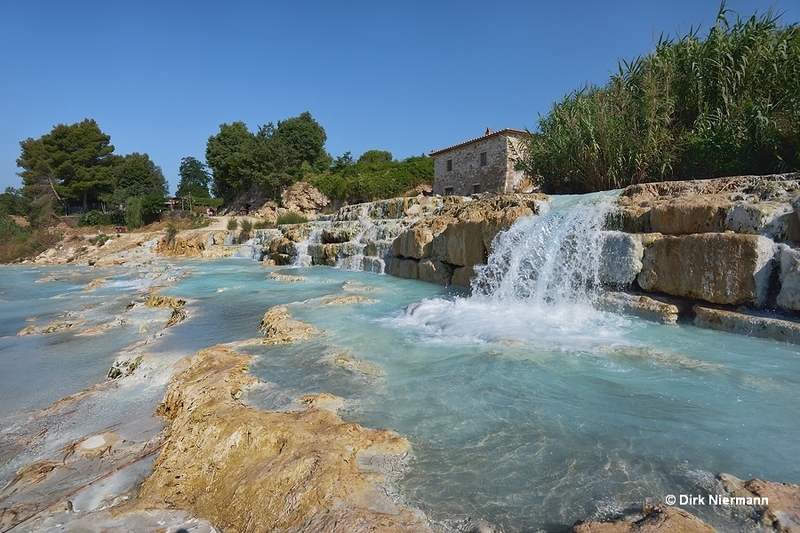 Already the foundation legend of Saturnia shows how important the local hot spring to people in ancient times was. As the story from Roman times goes, during one of the fights in the long lasting conflict between the god Jupiter and his father Saturn, Jupiter launched a lightning bolt against Saturn but missed him. When the projectile hit the ground far north of Rome, its power blew out a crater and its heat warms the water that wells into the basin for all times. 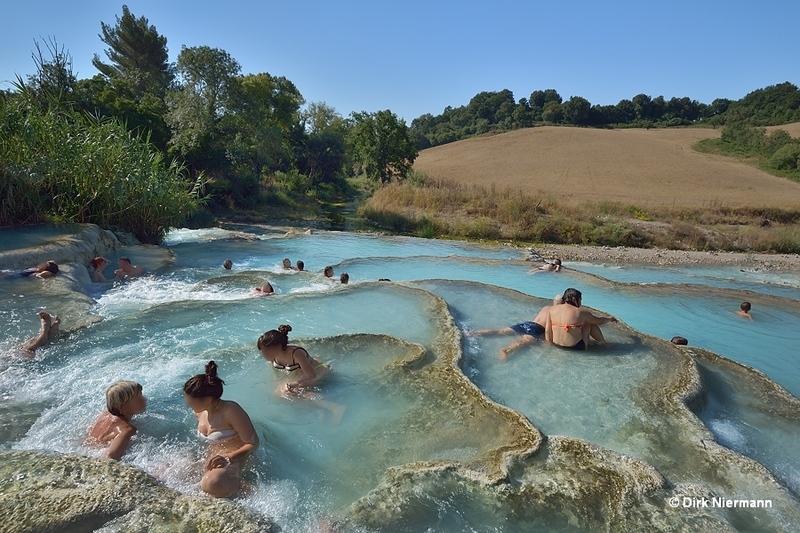 Nowadays, the hot spring from the legend is enclosed in the Terme di Saturnia Spa Resort and only accessible if you are willing to pay the entrance fee. 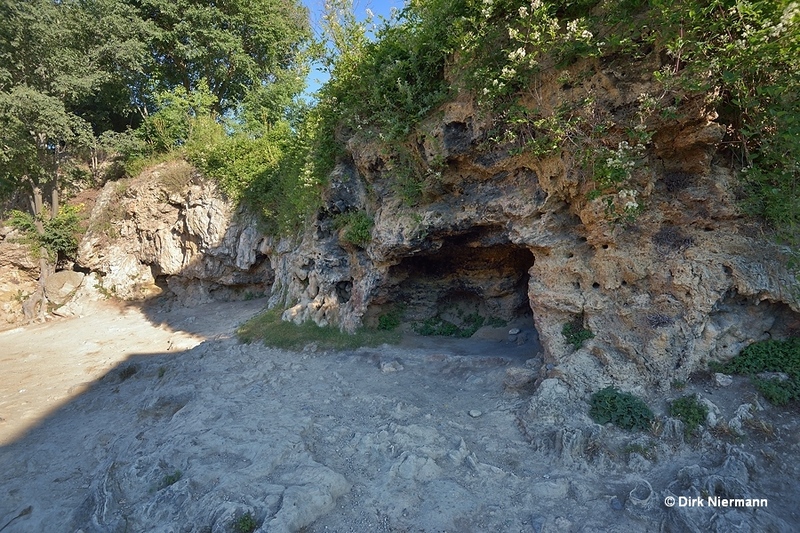 Scientific investigations revealed an utilization of the spring already in the Etruscan period, more than 3000 years ago. Its thermal water arises from a depth of approximately 200 m (660 feet) into a crater measuring 40 m (130 feet) in diameter. The water temperature is constant at 37.5 °C (99.5 °F) at a flow rate of 800 liters per second (12,680 US gpm). Up to the well it has travelled a long way from the slopes of Monte Amiata at about 25 km (15 miles) distance. 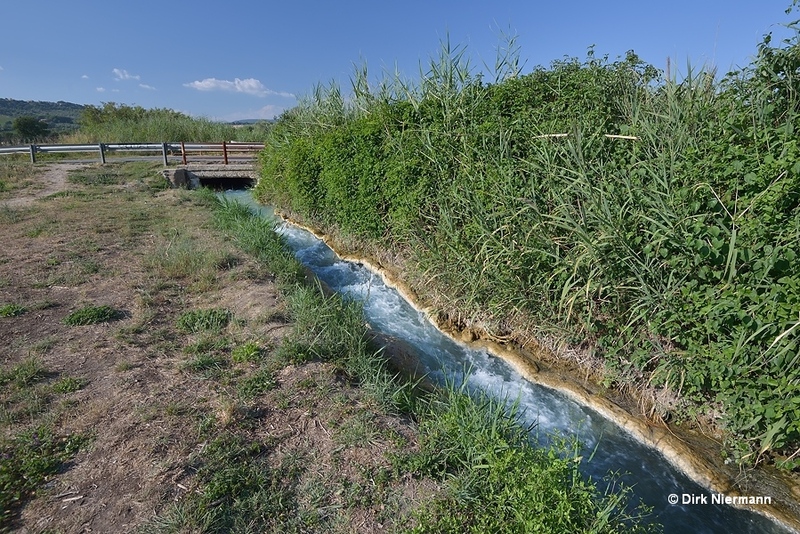 From the outlet of the spa resort a small thermal stream called Gorello (duct) drains the used, bluish opaque water through open fields inside a travertin channel over a distance of 1.3 km (0.8 miles) in southern direction. In the course of this the water temperature drops from 36.5 °C (99.5 °F) to 34 °C (93.2 °F). More than head-high reed lines the Gorello on both sides, obscuring more distant views. After tunneling the main road the Gorello soon arrives at Bagni di Saturnia's famous thermal waterfall, which carries the name Cascate del Gorello (Gorello Falls) or Cascate del Mulino (Mill Falls). The old mill is still represented by the mill house, whereas the mill wheel is gone for a long time. 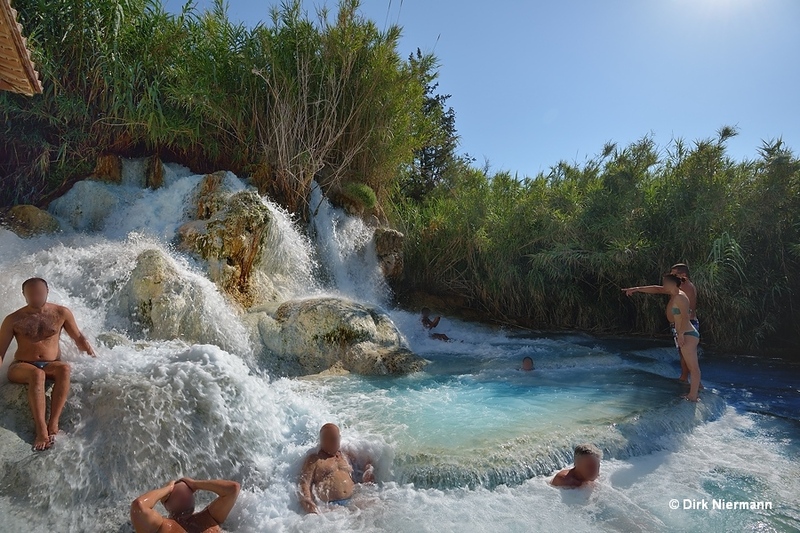 Cascate del Mulino features two outstanding attractions, which seem to be a little bit conflicting. 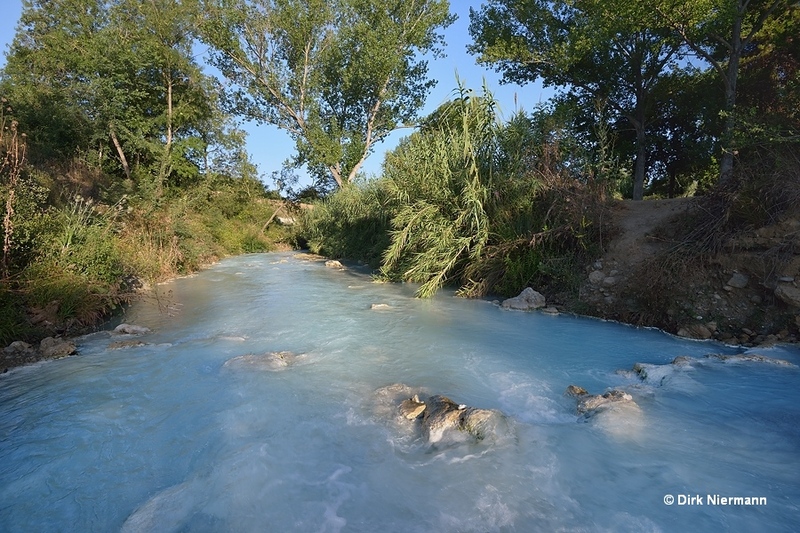 First, over thousands of years the carbonate rich thermal water has formed fanciful terraces, terracettes, and pools full of shimmering blue water. 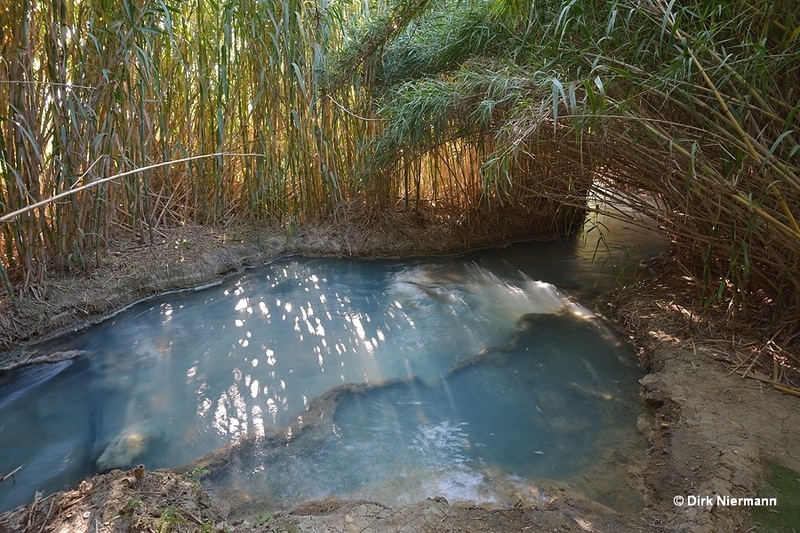 Second, the site offers free soaking 24 hours a day year round and so became one of the major attractions in the Maremma. If you look at the waterfall from the perspective of a nature lover and photographer, you will hardly catch any moment when the numerous pools are not entirely occupied by bathers. Not even at sunrise or sunset. But if you come to relax in warm water for free, this is the perfect place for you. Strictly speaking, Cascate del Mulino consists of two waterfalls, one above the other. The first fall beside the mill house, and the second one cascading from the drop wall of the elevated travertine terrace. But maybe you have noticed that on older pictures some terracettes and pools look different than today. Moreover, the former edge of the higher travertine terrace and the second waterfall are no longer existing as such. There is a sad reason for that. On October 14th, 2014, about 140 millimeters (5.5 inches) of rain and hail drenched the Maremma in just two hours. The river Gattaia burst its banks, hitting the spa terme and the surroundings by a devastating flood. Mud and debris caused much damage, and a landslide broke the lower terracettes at Cascade del Mulino. It took until end of April 2015 to secure the remaining terracettes by building a new supporting wall from large blocks of travertine. 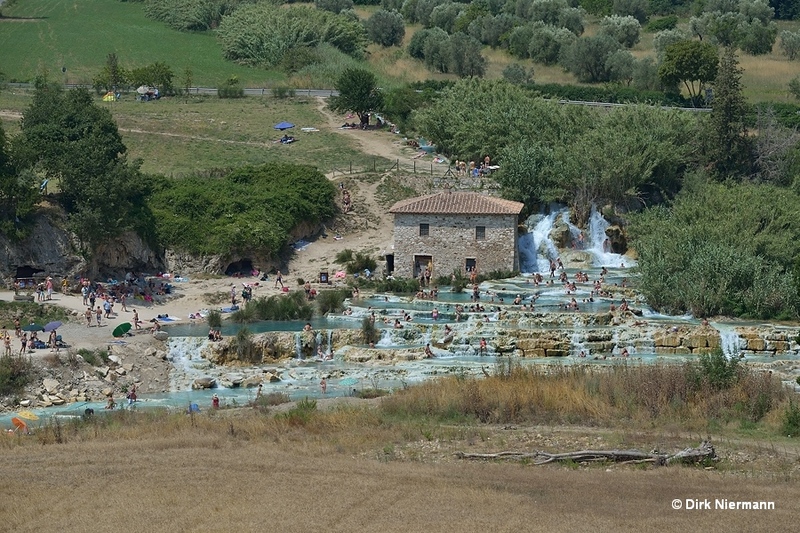 Close to the current waterfalls, thick deposits of old travertine form a fossil waterfall and prove a long continuous activity of the hot spring in Saturnia. They hint that the runoff took this course even in prehistoric times, but obviously more widespread. One can only imagine how magnificent the original setting must have been. However, it can be assumed that locals already very early forced the draining water into a single narrow channel to facilitate its utilization. After cascading down the waterfalls the thermal stream Gorello joins the river Stellata and clouds its water for a distance of several miles.